On a cold day in November 1944, eighteen-month-old Eileen Saxon was brought into an operating room at Johns Hopkins Hospital. She could barely breathe, and her lips and fingertips had turned a dusky blue, the result of a heart condition known as blue baby syndrome. An unlikely trio prepared to operate. Chief Surgeon, Dr. Alfred Blalock. Dr. Helen Taussig, a world famous pediatric physican and standing on a stool was Vivien Thomas, Dr. Blalock’s research assistant. Thomas was the only person who had ever carried out the procedure successfully, on a research animal, yet most people at the hospital thought he was a janitor. So why wasn’t he the one doing the operation? Born in 1910, Vivien Thomas dreamed of becoming a doctor. At age sixteen, he went to work and saved his money with the intent of attending college and go on to medical school. But before he could set foot inside a classroom, the stock market collapsed and sent the United States into the Great Depression. Thomas watched helplessly as the bank that held his tuition money closed its doors for good and his savings disappeared — along with his hopes of going to college. Needing work, Thomas became Dr. Alfred Blalock’s research assistant, a job he would hold for over thirty years. It would be Thomas, whose perseverance had him working long hours in the lab to find the solution to many important medical conditions under Blalock’s supervision. Yet, even though he was an equal creator of the blue baby operation, Vivien Thomas was not mentioned in any lectures or articles written by Blalock or Taussig. Was he upset about that? Murphy offers some suggestions as to why Thomas was overlooked (Was it because he was African American? ), but in the end this book is mostly about a remarkable, humble man who believed the work he did was what was most important. 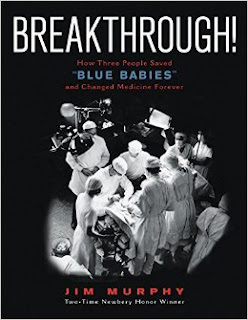 Jim Murphy, a master at crafting compelling narrative nonfiction gives readers a peek into factors that prevented Thomas from receiving the recognition he deserved for his role in this medical breakthrough that would pave the way for heart surgery for years to come. He incorporates quotes from primary sources, and peppers well-captioned black & white photos that enhance the text throughout. Back matter includes source notes, bibliography, and index. Breakthrough! is an important addition to library collections. An absorbing read. As a Clinical Scientist, I find this book review very fascinating. As an author, I can't wait to read. Thank you for sharing.